A kit to make a conventional 'rigid' bogie with no provision for suspension. Designed to accept a conventional 26 mm pinpoint axle as used by Gibson, Jackson, Maygib, Ultrascale, etc. Basic triangulation is provided to the coach body to avoid body wobble. Separate, optional mounting plates allow tension lock couplings to be fitted in the best position for the coach. This bogie was typically used on catering vehicles, sleeping cars and some articulated sets. A lightweight version of this bogie is also available. See MJT 2411A . 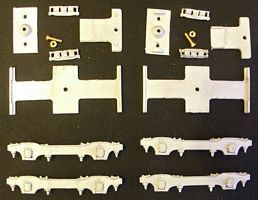 As an alternative, cosmetic sides MJT 2412 can be used with a rigid bogie frame MJT 2556 to make a rigid version of this bogie.